Like most of you I'm sure , I love discovering new brands, and I've been lucky enough to discover some real awesome ones through blogging and my work as a freelance writer. My latest discovery and obession is American streetwear label, Raccoon Brand, founded by filmmaker, Jesse Barack. I am loving their cheeky graphic tanks and tees, all featuring a mischievous raccoon or two - each style is unisex so us non-girly girls can rejoice at the masculine cut and more relaxed fit. 'The Night Is Yours' Tank in Black - Same Here. "As the moon rises, society's grip loosens an many of us transform into mischievous versions of ourselves." So why the raccoon you ask? Well for a start they stole a raccoon from a laboratory when they were in college, and really is their anything more mischievous than a raccoon? They look like little bandits and often cause trouble during their nocturnal antics. So, as soon as I pulled on my 'The Night Is Yours' tank, I felt like being a little bit naughty. So I didn't make the bed...that's right, I'm bad!! Is there anything cooler than this tank? And I'm sure the raccoon knows the dangers of second hand smoking, before someone yells at me. 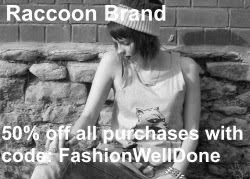 How are you guys liking Raccoon Brand? * T-shirt provided to me by Raccoon Brand for the purpose of this review, all opinions are my own of course, Gemma is not for sale. Hahhaha, didn't tide the bed huh, oh you bad girl you! Love the tees, they're really fun and go well with everything, or so I think :D Reminds me of Guardians of the Galaxy! Completely agree - a Rocket clone. I love how unique this shirt is! And you look amazing in it of course. You're really working it! And omg...you didn't make the bed??? haha :D That made me smile. You are one mischievous lady! These pics are seriously making my day. You look so tough! The "You want some" pic! ha :D Too funny! Great look!! Your shirt is so cool!!! Loving this tee and it's always so fun to discover new brands!! Great Tshirt, love it! And fabulous photos. love the top - gives a bit of attitude too I'm sensing lol! #fabbo! I have not heard of this brand before and it is definitely great to discover new ones. Such a cool top. I just love fun and unique designs.